Hola! I am a Licensed Clinical Social Worker in Southern California and I've been practicing for over 6 years. I received my master's from the University of Southern California in 2012. I specialize in Trauma-Informed Care, meaning that I recognize that people can have many different types of trauma in their lives from childhood or more recent that impacts their day to day life. I've worked in community-based organizations, with children, adolescents, adults and older adults dealing with depression, anxiety and various other mental health and emotional challenges related to unresolved trauma. In my practice, I have found the best way to collaborate with people in their healing journey is to listen, be empathetic, remain objective and use a cognitive behavioral approach to reflect back patterns that could be contributing to unhappiness. My focus is strength based, recognizing the individual's ability to make positive changes through the therapeutic process. I also like to incorporate expressive arts into my practice as a form of healing from trauma. I believe that through creativity and encouragement we can activate a ripple effect of happiness in others and ourselves. Mirna has been very compassionate and understanding towards me during difficult times. I appreciate her listening ear, sound advice, and encouragement. I'd definitely recommend her to other friends and family members. Mirna is a wonderful listener and is very apt at helping and understanding and where concerns, anxiety, or stress is developing from. Mirna is very understanding, accepting, and keen. She is always able to get to the root of the problem. She never judges me, no matter what I tell her. She is very supporting and has very instructive advice. I received so much helpful advice from Mirna on how to deal with stress. I've become a happy person because of it. I've also learned so much about myself through our sessions. We’ve been working together for about a month and I feel so relieved to have a therapist as supportive and caring as Mirna! If I’m having a tough time, I can count on her to give me an exercise or encouragement to help. She’s amazing! Mirna is a God send. I honestly can't emphasize enough how wonderful it has been to have her listening and supporting me. She is very professional and sympathetic. If there was anyway I could recommend her for more praise I would. So far she listens well and explains how to identify stressors and handle them in a healthy manner. I was really apprehensive to begin counseling but boy, was it one of the better decisions that I have made! I came to Mirna with a lot of anxiety and bouts of depression. We work on exercises and changing my way of thinking and I can honestly say it has changed my life, my habits and my outlook. She relates on personal level, she remembers my stories and what I’m struggling with. I share things with her that I speak to no one about and I feel safe and no judgement. I appreciate her with all my heart and thoroughly look forward to our conversations each week! Mirna is incredibly knowledgeable and sincere. She makes me feel comfortable enough to share my trauma with her and provides ways to figure out the solutions to my issues. Her approach seems very client centered and she is also very culturally sensitive. I really appreciate her and I'm grateful for her as my therapist. Would you like to write a review for Mirna Beltran? 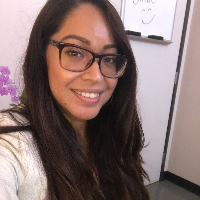 We'd appreciate if you can spend a couple of minutes to write a short review for Mirna Beltran (LCSW). This review would be shared with Mirna Beltran. It may also be posted in our website or in Mirna Beltran's profile but it would be anonymous and your identity would be kept completely confidential.